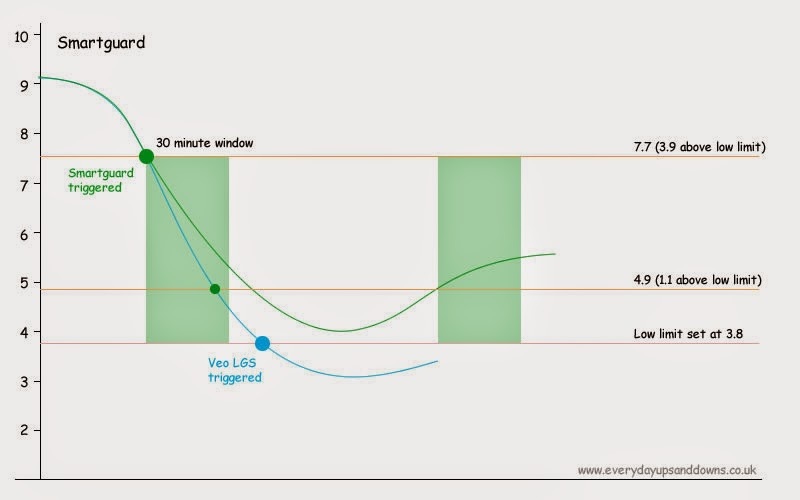 Those familiar with Medtronic's Veo may have come across the term 'Low Glucose Suspend', the facility where overnight the Veo (when used with Enlite CGM sensors) can automatically stop basal insulin supply if the pump detects a predetermined low glucose threshold has been passed. This has been shown to significantly reduce the severity and duration of overnight hypoglycaemia in clinical trials and was welomed (particularly by parents of T1 children) as a major step forward towards developing the 'artificial pancreas'. The MiniMed 640G takes this approach to a whole new level with 'SmartGuard', an algorithm that begins to take effect significantly before you have hit your 'low' level, attempting to dodge some of those pesky hypos altogether. The sensors are Enlites again, but with a new (and apparently much improved) 'Guardian Link' transmitter to boost performance. Up to 5 different basal patterns with up to 48 rates per 24 hours each. The thing Medtronic were clearly most excited about was obviously 'SmartGuard', so it's probably worth trying to note down what I can remember about how that works. SmartGuard builds significantly on the premise of Low Glucose Suspend by making the whole thing much more predictive. While Low Glucose Suspend only kicks in when you are already registering low, SmartGuard acts earlier trying to head off the low by temporarily stopping basal (in much the same way I started doing while wearing a Libre sensor - see 'new technique'). They had a snazzy graph in the presentation to explain how it works, which I've attempted to recreate here. On the pump you set a 'low' limit that you do not wish to fall below - anywhere between 2.8 and 5.0 in 0.2mmol/L increments. Above that the pump sets additional 1.1mmol/L and 3.9mmol/L guides. SmartGuard is triggered if sensor glucose values fall below that upper line (3.9 above your low limit) AND are falling sharply enough that you are predicted to fall below the 1.1 line within 30 minutes. All insulin is stopped for at least 30 minutes from that point (including basal and any partial dual or square waves still in progress). 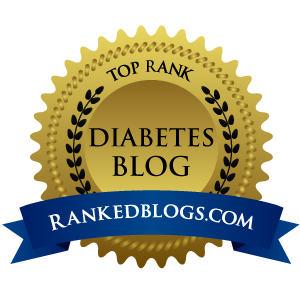 If your numbers stay down, the insulin stays off for a maximum of 2 hours. Basal delivery (only) automatically resumes once you have risen above the 1.1 line AND are predicted to remain there for the next 30 minutes. Users can, of course, cancel the SmartGuard intervention at any point (eg if they would prefer to treat the impending low with some tasty fast-acting carbs. Rather neatly you can also choose whether or not the 640G alarms or alerts at any of those points and even tailor what times of the day (or night) to switch SmartGuard on or off. 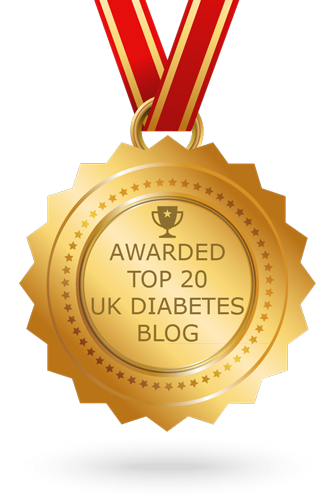 Alternatively you can simply run the system as the current Low Glucose Suspend works. It was claimed that in the 'Pilgrim' study, the same algorithm that powers SmartGuard was able to avoid 80% of potential hypoglycaemic events both day and night. If those results could be reproduced 'in the wild' it would be nothing short of groundbreaking. A handful of people have recently been able to use the 640G on a trial basis at Kings College Hospital and two of them (including @desangsue) shared their experiences. Responses from other hands-on users are also very encouraging and seem to suggest that many found SmartGuard alone was sufficient to cope with moderate exercise. After a short while to build trust, many were also happy to simply let SmartGuard do its thing silently and alarm-free, only realising when checking the pump later that they had been spared a low-level dip here or there by some automated basal jiggery-pokery. The only mandatory alarm that sounds would be if your sensor glucose fell below your 'low limit'. This is a good thing. But the customisability of those alarms, while preventative action is automatically taken without confirmation being required seems to go a long way to prevent CGM 'alarm fatigue'. The 640G pairs with a Bayer meter that looks just like the existing Contour Next USB, but this souped-up '2.4' version has some extra cleverness under the hood. For starters you can use it to deliver a quick manual bolus of any number of units you choose without having to fish the 640G out of your pocket. You can also create up to 8 bolus presets (which can include predetermined square or dual-wave options and doses) on the 640G that can be fired from the meter. Frustratingly you cannot vary the doses of these presets from the meter itself at the point of delivery - which would make this much more useful for me - and neither can the meter act as a fully fledged bolus wizard as it does with Roche pumps. 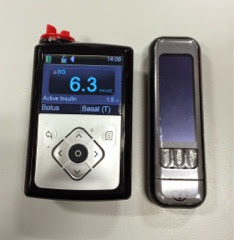 However *some* meter bolus options are certainly better than none, and I can see that these could be very useful for snacks and preset mini-corrections or standard preboluses. The new BG meter also acts as the USB conduit for uploading data to the Carelink software package which (mercifully) is also getting a complete overhaul very soon. That's all very well you may say, but I'm about as likely to get funding for full time sensors as I am to become the next Pope - is this all about SmartGuard, or is there anything here for non-CGMers? It is true that Medtronic are putting a lot of emphasis on SmartGuard - they are keen to describe the 640G as a 'system' rather than just a pump. It seems they are trying to work with Healthcare Professionals and NICE, seeking to allow more people to access this sensor augmented, 'virtual pancreas' approach. Swift murmerings were made about price points and volume but no real detail given as to if (and how much) sensor cost may fall if there is a greater uptake. However even without all that sci-fi automation there is much here to please regular pumpers. A colour screen is pretty much a given these days, but the layout and icons here are well thought through and in themselves allow quick access to a detailed and drillable overview, similar to but richer than the 'back button' on old MiniMed pumps. Bolus and basal adjustments are available direct from the 'home' screen, and everything is navigated by the 4-way/OK controller plus two other buttons - one for 'menu', the other for 'back'. Pleasingly, pressing and holding the 'back' button takes you directly to the home screen however deeply you are embedded in within menu options, which is a nice touch. A great deal of attention seems to have been paid to the available options to make the pump more customisable and personalisable for individual users. 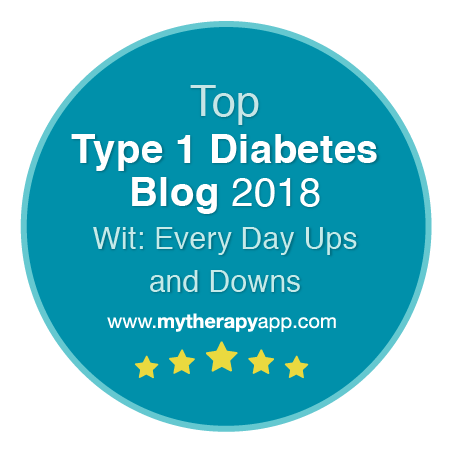 For many things (such as basal patterns) you can now choose named versions eg 'work day' or 'illness' that make them more self explanatory to use, alternatively you can still opt for the more usual numbered options. You also have the option of setting all sorts of presets, including temporary basal rates of predefined length/intensity (again with named alternatives). Whatever you choose to populate from the available options in setup screens get shown in the selection menus, but you don't have to wade through dozens of items that you never use if you don't want to set them up. So you might choose to set just two of eight available TBR presets one for 'moderate activity' and another for 'light activity', then when setting a TBR you can choose either of those or dial in a custom one. Overall it felt logical, intuitive and that several regular tasks would be faster to achieve. The added complexity might mean an additional button-press here or there for one or two things, but in the hour or so we had to play with the 640G most things I wanted to access within a few presses I could. Battery life is anticipated to be around 2-4 weeks, depending on use. The 640G needs the slightly larger AA batteries (rather than the Veo's AAAs) to power the colour screen. In the top menu bar the battery (and other) icons re-colour to indicate their status. On the battery front, as well as the usual 'low battery' warnings at 25% and again (if I remember right) at 5% there is also an inbuilt 'get out of jail' rechargeable battery that will allow the pump to limp on for up to 8 hours if you find yourself stranded in a motorway traffic jam or somewhere with no shops over a Bank Holiday having paid no attention to the icons/alerts when you set off. I also unwittingly tested the "what happens if you need to change battery in the middle of things" situation and a trial TBR I had set running happily carried on after I took the battery out to have a look. Another neat trick is that the standard-issue belt clip can be swiftly detached and is moulded in such a way that it can be used instead of a coin to unscrew the battery cap. Just a nice bit of attention to detail which speaks highly of the amount of effort Medtronic have put into the design of things. Infusion sets and reservoirs are exactly the same ones used in the Veo, but special mention must go to the 'Infusion set change' alarm which you can set as a reminder. This particularly caught the imagination of Paul B who said that as a feature, it was pretty much enough to win him over on its own. To be honest I'm going to have to stop there - it's suddenly got rather late and I had thought I was just jotting down some quick notes. It was a very interesting day and there were other snippets (such as the iPort) that will have to follow later. In short, I will have had Artoo for 4 years in November this year, at which point the warranty runs out and my robot counterpart begins to live on borrowed time. While I'm not champing at the bit for a new pump, I had absently been wondering what I might look at next. I am still interested to find out more about Roche's Insight pump. Omnipods don't feel right for me, and until today I was fairly certain that the Animas Vibe was my front runner because of Dexcom integration (and longer sensor life if I ever take the plunge to self fund). I know that for many the lack of a fully functioning remote handset on the 640G will be a dealbreaker, but that really doesn't bother me much. Today has given me much to think about and Medtronic's new offering very clearly sets itself apart in the market by doing something that absolutely no other pump can do. Update: I have been given the opportunity of trialling the MiniMed640G for 64 days and will be posting video diaries of my experiences. Watch the videos. Disclosure. Medtronic generously paid my train fare and laid on a tasty lunch. I was not asked and have not been paid to write this post or publicise their products in any way, but thought you lot might be interested. Thank you for this info. My son is about to get this pump in a few weeks, and I'm v excited about it as he has full time CGMs. Note that on the VEO, the low suspend is active all the time (on or off) - not just at night. i have the new $11,9490 medtronic mini med with sensor. For the money my blood sugars shouldn't ever be high I do what im told and eat 45 carbs each meal no more but my blood sugar still gets in the 300's and really what is all this for. the sensor is there only as an aggravation. I still have to prick my finger. I just think it a waste of money. If you're going to make a pump that cost as much as this is should sensor your blood sugar and administer the insulin as needed. That would make it worth the two ports I have to deal with everyday! My blood sugars go high even when I put my carbs in before I eat. Thanks for the clarification J Roebuck! Hope your son gets on well with the new pump and that it lives up to the marketing hype. Having said that, having a Low Glucose Suspend CGM that really can interpret results and 'predict' is surely progress. Having the Libre is great, but some lows come on too quickly to prevent them, and similarly how do you know how high a high is going to go....? I would have no problem allowing myself to be a guinea-pig to a pump collecting data if it really can show some kind of pattern. You state: "regrettably it looks like FDA approval for the US could take years" Is thgis opinion or do you have a pipeline to the FDA with information that MiniMed is not releasing. They are claiming an April 2016 release which would be fantastic! 'Could take years' was the indication I picked up from Medtronic pre-launch and (most likely) based on their experience with approval of the Veo. You may have more current information. The feeling I got was that timeline through the FDA maze could not really be accurately predicted, but Medtronic may have learned more now, and perhaps the passage has been eased by the approval of the Veo? You would need to contact Medtronic in your own country/territory. In the UK, the 640G is available free on the NHS to people who meet the NICE criteria for pump therapy and is supported by an appropriately trained clinic/Consultant. I'm not even sure we can buy pumps here even if we wanted to. I think they can only be acquired through 'official' channels to ensure they are properly supported. The 640G launched in the UK, Sweden, Denmark and Australia and I guess will be rolling out to other countries as regulatory approval permits. Is there anyone that has tried this pump and CMG? My son is due for an update and it would be nice to see if the accuracy of the CMG is any better than the last. It doesn't do you much good to have it stop giving you insulin when your blood sugars are already high but the CMG is reading that it is low. Hi Anon, thanks for your comment and sorry to hear about your experiences, and that you felt my post was unbalanced. I did try to make it clear that these were just my 'first impressions'. I have been watching posts by other 'real world' users on Twitter and I have not heard anyone who has had as negative an experience as you, though some are posting concerns of their own - not that this will particularly help your situation, but just to acknowledge that I am aware of users who are experiencing problems, and other users who aren't. Hope you find a solution to some of the problems you are experiencing, I saw a tweet from @mm640G yesterday who outlined a variety of SmartGuard settings he was using to avoid early basal interventions (eg low list of 3.0 to attempt to bottom out at 4.1). Might be worth you trying to fnd that post. Cheers for your speedy reply, and sorry if I sound like I'm ranting (although in fairness I am!). I just find it pretty shocking that a basic product launch is not accompanied by any support/product failure replacement from the company (including, and still as of Thursday they still haven't got the batteries on their system to order-which given the pump burns through them at one every other week would seem funny if it weren't so concerning...fine, I can afford at the minute to buy the lithium energizer batteries that they seem to require, but at £7 a pack many won't and this financial burden should be pointed out). Perhaps you would be better turning SmartGuard off and just running with Low Glucose Suspend? Such a shame it's gone larger surely they should be aiming to reduce its size. 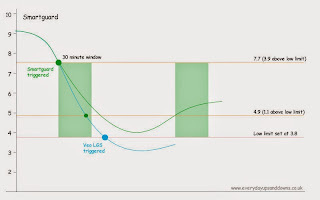 Does anyone know why the animas vibe ONLY ALLOWS 12 basal rate changes in a 24 hour period. In my care 24 should be the minimum, 48 better to allow better fine tuning. It isn't *very* much larger than the Veo to be honest, and given that the number and distribution of buttons allows for more navigational flexibility, and that the screen is significantly larger I guess some small increase in size is not surprising. The larger/colour screen needs beefier battery support too, of course, which could have added further to the size. All that being the case, I think they've done pretty well keeping the size as similar to the Veo as they have. As to basal rate patterns, yes 48 potential zones does make the 12/24 look a little meagre, though I have to say I only ever use around 9 out of the potential 48 with several of them lasting for several hours each and the shortest time block being one short burst of 60 minutes. I can't really imagine needing anything like 48 half hour segments myself, especially since I try to make basal rate changes around an hour or two before I want them to take any effect. Any more immediate changes I usually make with Temporary Basal Rates. Different people might have different strategies, of course. Have decided to select the 640G as my next pump. I use the VEO at the moment so used to the minimed kit and like the Enlite CGM. I rode the mHealth tour a couple of years ago trying the Dexcom G4 during the 1300 mile ride across Europe. Unfortunately the G4 failed at key stages when I really needed to know my BG (a 10km mountain climb, for example). I fitted the Enlite lite sensor after repeated failures of the G4 and thankfully the Enlite worked flawlessly and gave me the confidence to push harder. News of a predictive algorithm to trigger the low suspend is a big sell feature. Even if it works for a fraction of the claims, this 'smartguard' feature is something difficult to pass up. The low suspend of the VEO was good but lacked what i hope this feature cures. The G4 sensor has an advantage over the Enlite because of the remote display. I checked with Medtronics as I understand developments on an app for the iPhone (and hopefully android) is underway and due out later this year. It is useful to have a remote display when riding a bike!! The Bayer next link BG meter works well on the VEO and will calibrate and remotely bolus the 640G. The new 640G insulin pump is available in France too (3ml version for the moment, 1.8ml version soon I think). This new pump was shown in the SFD Bordeaux meeting in March. I live in Bordeaux and have this pump now. I got it in May. I didn't find so nice and precise the "low suspend" function on the VEO pump but I hope it will be better with the 640G. I haven't tried the sensors with the new pump, for the moment. w.r.t. the Roche Insight: I attended a presentation of currently available pumps, with the Insight among them, where I got to query about changes from the Combo (my current pump and the predecessor to the Insight). Unfortunately IMO they're sticking with what is a deal breaker for me: the "active insulin" reading does NOT include all active insulin, but only a correction dose from the bolus calculator. 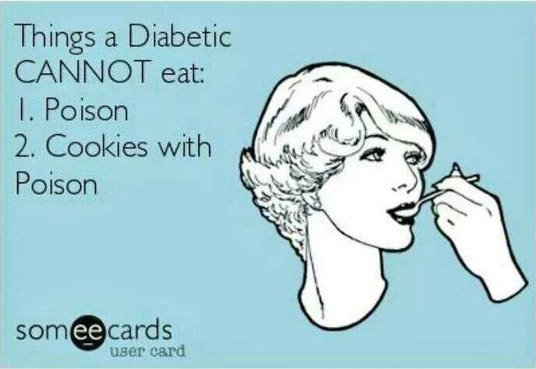 Their position is that the amount of insulin used for a meal is irrelevant since it's been accounted for by the meal. So with the Combo I can get a reading of 140mg, which is flagged as being too high, with active insulin reading 0 and no suggestion to correct. I find this rather confusing and seriously unhelpful as it's contradicting: why state I'm too high? Why no suggestion to correct if no more insulin is active? Also the pump has a setting for post-prandial values, where I set I consider everything 2h after a meal post-prandial, so 140mg is valid during that period. However, I still have to manually define the reading as post-prandial, because the pump apparently can't do math with dates. Or something like that. In the end this makes the bolus calculator unusable to me as it fails to state how much insulin is active. And their argument that food-insulin is already accounted for does not apply to me at all: I need to adjust basal or eat something when I commute or walk 15m if any kind of insulin as active (dosed in the last 3h). I thus stopped using the bolus calculator altogether as it's more misleading than helping (looking up last insulin doses is slow and cumbersome when used with the calculator). 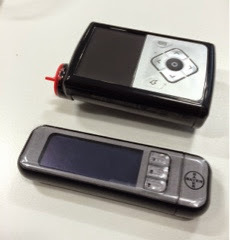 To finally get to the end: at the mentioned presentation it was confirmed that the Insight has the same 'active insulin' display. I hope this doesn't come off too rant-y, but I felt this should be shared as it's something that I consider a serious defect and which only becomes obvious when using the device (the manual mentions this, somewhere in the last third, after just stating talking about "active insulin" for multiple times). Been on the 640g for a while. It's a great pump, not that much bigger than any other pump. I held it side by side with the veo and my roche combo. The enlites have been absolutely bang on for me, I've managed to keep one sensor accurate for 21 days. Smart guard has saved me from a number of night time lows. Not had any problems with the clip, been clipped to my belt, smashed into door frame, walls and no damage to pump or clip. A worthy upgrade to my Combo. Got my new 640G a couple of weeks ago. Very pleased with it. I had previously had a Paradigm for 5 years and a Paradigm Veo for 4 years. Was not very pleased to find I had to get a new sensor transmitter to go with the 640G. Fortunately the Medtronic ppl came to the party and gave me a free upgrade from my last one. There do seem to be some issues with lag time with the sensors, not sure yet whether it's me, the sensors or the hot summer environment at the moment. (Mel., Australia). I have had very good support from Medtronic here. Pluses are the new screen, the SmartGuard (it's amazing!) the deeper programming functionality, the waterproofing (Hooray). Minuses are the constant reminders for everything... (will look further at which ones I can turn off), and so far I haven't been able to work out how to extend sensor life with this one. If someone knows could they please reply to me? All up a great improvement on the Veo, and the SmartGuard means I am no longer stuffing my face with rescue food every day! Good to read your experiences Cath, others I have seen commenting who have used Enlites before seem to get greater accuracy and less lag with the new sensor - hope any issues you have had so far turn out to be temporary. For restarting the sensors from what I have heard you need to disconnect the transmitter from the sensor, then re-attach and go through the 'start new sensor' screens. This could also allow you to fully or partially recharge the transmitter which might help if running sensors back-to-back. 6.5% - Are they mad?